Brainstorming unorthodox solutions for “recharging” Lake Chad was on the agenda at the International Conference on Lake Chad (ICLC) hosted by Nigeria in February. The West African lake, once the fourth largest on the continent, has lost 90 per cent of its water mass over the past 50 years due to a combination of population growth, irrigation withdrawals and climate change. This has threatened the livelihoods of over 40 million people in the region who depend on resources from the lake for crop and livestock farming, trade and fishing, according to UNESCO officials. 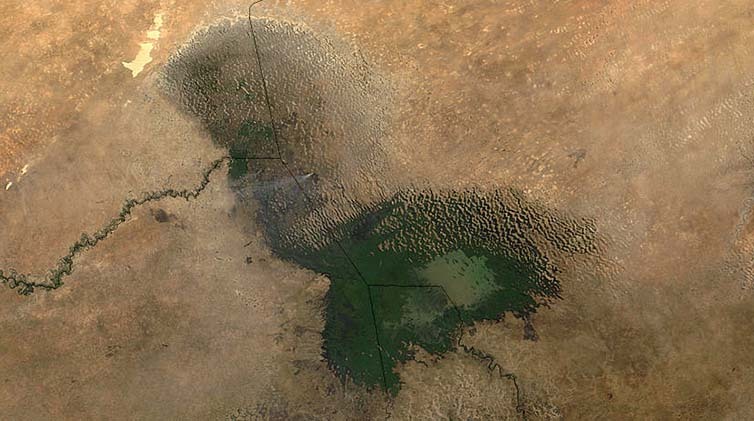 Lake Chad’s current basin covers portions of Niger, Nigeria, Cameroon and Chad. The lake’s situation has been a major contributor to deteriorating economic conditions in the area, with an estimated 10.7 million people across the basin in need of humanitarian assistance. Extremist groups like Boko Haram and the Islamic State in West Africa have moved in to exploit this vacuum, making the task of revitalizing the lake all the more urgent. A massive water diversion scheme, first proposed in 1982 by Italian engineering company Bonifica SpA, has emerged as an unlikely answer to Lake Chad’s water woes. It calls for the construction of a 2,400-kilometre-long canal to transport water from the Ubangi River on the border between the Central African Republic and Democratic Republic of the Congo to the Chari River basin, which feeds into Lake Chad. The Ubangi River is one of the main tributaries to the Congo River, the second largest river in Africa. Dismissed for decades as both expensive and impractical, the project’s momentum is now slowly building. Delegates at the ICLC agreed that Bonifica SpA and PowerChina should move forward with a feasibility study, with an eventual estimated price tag of US$50 billion to $80 billion. PowerChina is a Chinese state engineering and construction firm that was behind the construction of the iconic Three Gorges Dam project. The project would divert around 100 million cubic metres of water per year, an estimated 3 to 8 per cent of the Congo River’s eventual discharge into the ocean. Beyond the steep financial hill to climb, the project is anticipated to face fierce environmental and political headwinds along the route.